Sober in a Nightclub: I'm rather offended by that. What, with all the racism, sexism, etc. going on in the world, now we have no right to be offended by these injustices? If no one speaks out on them, how will we bring about change? No, if you offend me, I WILL let you know, in no uncertain terms, why you are wrong. Silence equals permission. But, by the same token, we are obliged to congratulate those whose actions we admire. Often, those who say things like this are the very ones who make offensive statements. So, I did some checking, and, sure enough, he doesn't practice what he preaches. First of all, why should I take advice from someone who was kicked out of not one, but TWO schools, as well as spending three months in jail for credit card fraud, as he was? And, what about this, Mr. Shining Example? 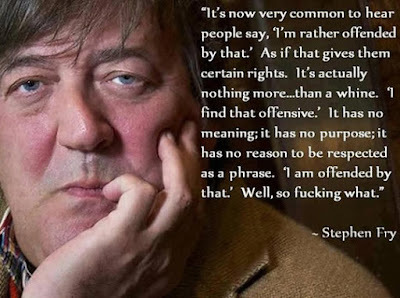 "Taking offense" is, essentially, a power-and-control ploy used by those who wish to control others into doing whatever they think is appropriate, or to express disapproval of those who don't do things the same way they would.